After we left Bimini, we sailed with our friends from S/V Rhiannon for three consecutive days but were able to sleep at night at anchor. The first day we sailed for eleven hours straight east across the Bahama Banks where it is only 15 feet deep. We trolled even though we knew in 15 feet of water we would not catch any great eating fish. Luckily we only caught one barracuda but we did catch some jacks. We threw everything back but it was fun none the less. Long sailing days can make for restless kids but they all three did great. As the sun started to set we sailed 10 minutes north of the main rum line and dropped the hook. It’s kind of fun yet a bit spooky to be anchored in the middle of the ocean with no land in sight. We got some good sleep and raised anchor on day two at 5:00 am. We sailed ten hours and were able to troll once we got off the Banks and headed into deeper water. We found a two mile long weedline and were giddy as all get out. This was our chance! After about a half hour of trolling along the weedline we heard the reel sing. Fish On! We immedialtey went into action…Marc grabbed the pole, Cam grabbed the hammer, I grabbed the camera, and Joellen grabbed her book (she has no interest in fishing). 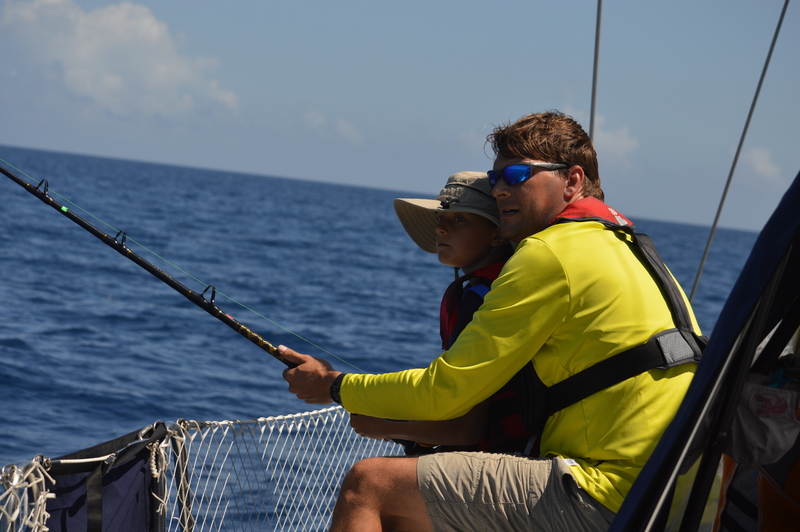 It was another Bull Mahi Mahi but smaller than the one we caught on the way to Bimini. Because it was smaller, Cam was able to help reel it in. Look how beautiful he was. Just gorgeous. But as Marc and Cam were pulling the fish up the side of the boat, just like that, he got away. Talk about disappointment. 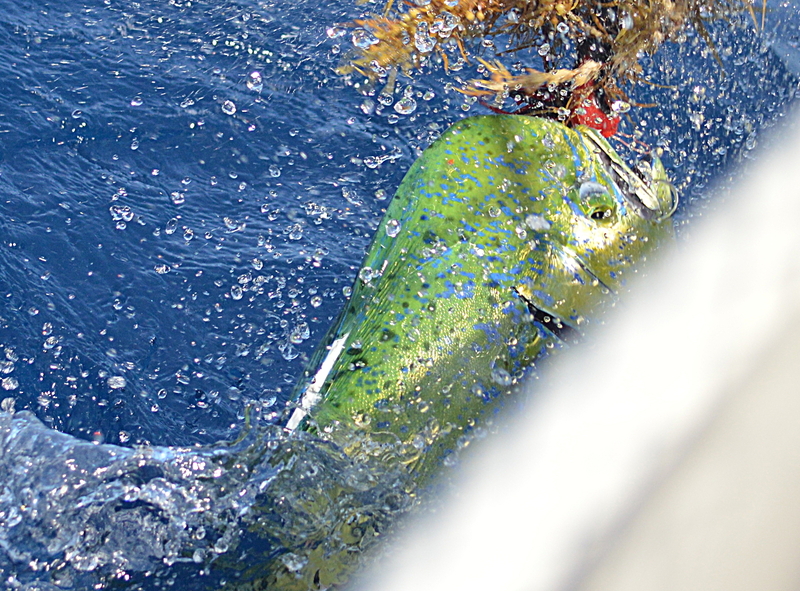 That Mahi was so close we could taste it. So instead of fresh Mahi on the back grill that night, we had pasta. Oh well…next time. A few hours later we arrived at Rose Island, the island due east of Nassau. Rose Island has a beautiful anchorage and we watched the sun set over Nassau with the Atlantis Resort off in the distance. 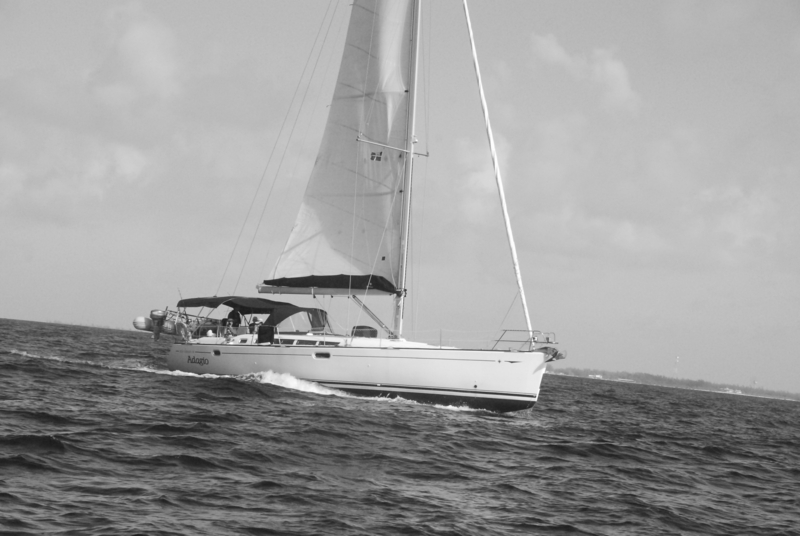 We got another decent night’s sleep and on day three only had an eight hour sail to the island of Eleuthera. 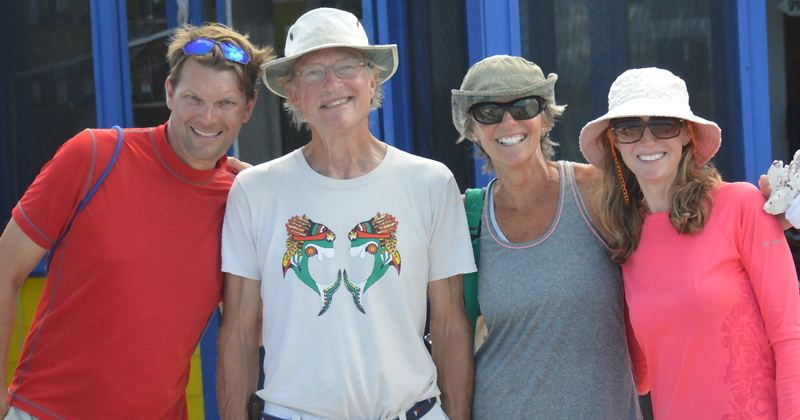 In all honesty, we were going to skip Eleuthera until we met a couple, Mike and Cathy, in Bimini who were on their way sailing to Eleuthera. They told us we had to come visit them in Eleuthera because they have a house there they built by hand and they wanted to show us around the island. I don’t think they thought we would actually come. They obviously don’t know us Konescos. You invite us…we come! We pulled into the quaint working town of Hatchet Bay and the mooring ball had no tackle. We told Cam we’d pay him a quarter if he would jump in the water and fish our lines through the mooring ball. That kid will do anything for a quarter. Then as soon as Cam came on board to dry off, Marc and the girls set off in our dinghy to help our friends on S/V Rhiannon secure their dinghy lines. The next morning we were on a mission to find our friends Mike and Cathy. We knew they lived a few miles north of Hatchet Bay, next door to the town nurse. We figured the locals would know where the nurse lives. So we hitch hiked (everyone hitches on Eleuthera) and got picked up by the local Baptist Church bus. What a hoot. As we were driving down the road I yelled to the driver to stop because we saw our friend Mike walking along the side of the road. We jumped off the bus and Mike said, “Marc, Jen, is that you? You actually came? I can’t believe it.” Mike informed us that his wife ended up flying back to the US but that he’d love to show us around. The next day, Mike took us to his house and showed us all around the island and took us to places we never would have found. We had our own built-in Eleuthera tour guide. Eleuthera is famous for it’s pink sand beaches. While you cannot see it in these photos, the sand really is pink. Just beautiful. As I was walking down the beach with Maria as she was having a full blown meltdown, I saw a couple in the distance that I recognized walking towards me. Could it be? 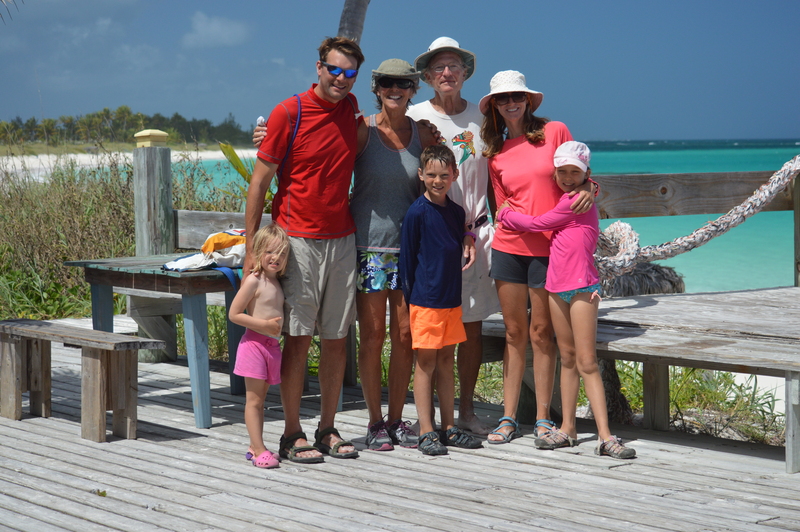 Barbara and Greg from Boston whom we met a year ago in Marsh Harbour, Abacos? It took us all a minute to register and then it was sheer joy, screams, laughter, and hugs. Last May, our boat was anchored right next to theirs and the Sunday before Mother’s Day, we went to mass together. Barbara had just lost her mother so it was a very emotional day for her and we bonded very quickly. It was so wonderful to see Barbara and Greg again. Three days ago we decided it was time to leave Hatchet Bay and head to the southern end of Eleuthera. We’d been in Hatchet Bay for a week and our dinghy needed some serious repair due to a substantial rip in one of the seams (see photo). 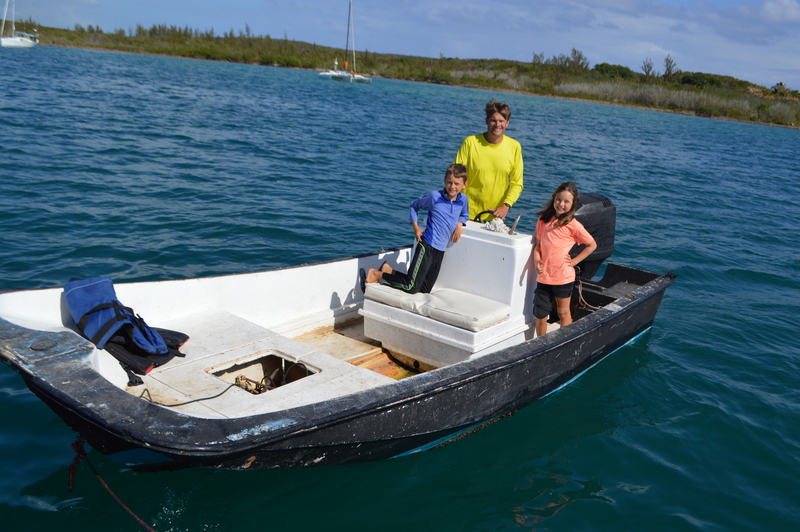 A guy named Donald from the southern part of Eleuthera came recommended for any boat or dinghy repair. We called Donald and he told us to sail down to Cape Eleuthera Marina on the south side of the island and he could make the repairs. 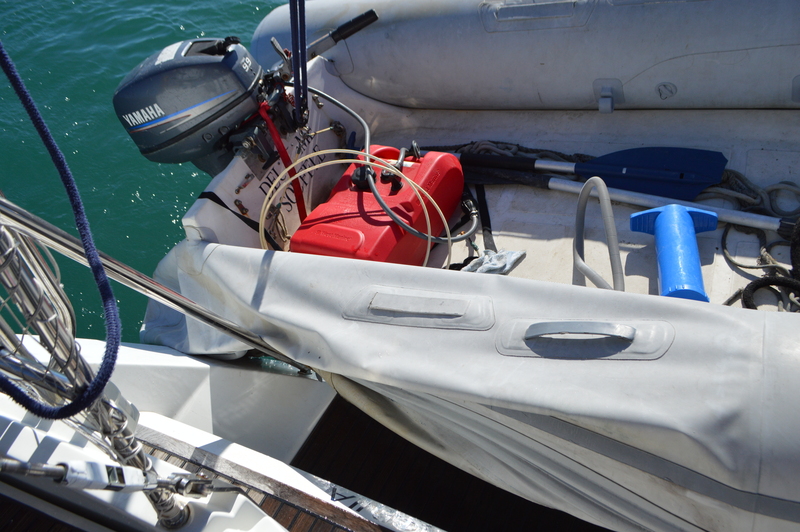 So we pulled the dinghy up on the davits and headed out for a full day of sailing south. We wanted to head south anyway so this was perfect. A few hours later, Donald showed up to Hatchet Bay with his pickup and a trailer for our dinghy. Donald knew we’d be stranded on the boat for a few days without a dinghy, so he got his buddy Ben to lend us his boat. Amazing! We just cannot get over how giving and friendly the Bahamians are. Check out our new wheels! Needless the say the kids were thrilled, especially because this boat can go FAST. It even had the smell of rotten conch which made it that much cooler. This was the real deal. Yesterday Donald, Ben, and Donald’s son Talino came back to make some final repairs to the engine. Just as they were finishing, our friends Barbara and Greg came over. It was Barbara’s birthday and we were having them over for dinner. We asked Donald, Ben, and Talino if they would like to stay for the birthday dinner. Without hesitation they said yes and now it was a big party. Donald dinghyed back to the dock to get his guitar and drum to play music for us. I guess he must carry a guitar and drum in his pickup at all times. He said it isn’t a birthday without music. What a special night. With the engine repaired, we plan tomorrow to set sail again heading south. We are still going to the marina on the southern tip of Eleuthera. We need more diesel, I’d like to do a few loads of laundry, we need to pick up our dinghy from Donald, and Donald invited us over for dinner at his home. Donald said all his kids play instruments, so this should be quite the band! Eleuthera’s landscape and beaches are beautiful but even more beautiful are the people that live here. Paradise found. Anyway ya’ll might post some video with your next blog ? That would be great ! We have nothing to take video with unfortunately. We have only one iPhone on board and we dropped it and it now takes horrible photos and videos. We don’t have a go pro or anything else that takes video. I’m thinking for our last blog post to put lots of photos to music. Great idea though. I’m just sticking with photos for now. “…and Joellen grabbed her book (she has no interest in fishing).” Love it! That fish was beautiful. Sorry, Cam. Guess he knew your reputation as a fisherman and wanted to get away!! Jen, I am always amazed to read all about your adventures. Your photos are fabulous and I love them all. May I ask what kind of camera you use? The photos are such high quality. My daughter is planning on a new one, but not sure what kind to get. Please never stop writing. We all are enjoying every word! lens I bought separately. The zoom lens is a Nikon DX AF-S Nikkor 55-300mm. Hope that helps. Oh, thank you so much! I will pass on the info to Renee. Keep taking those beautiful photos and I will keep waiting for your blog posts! PURE AWESOMENESS!!!!!!!!!!!!!!!!!!!!!! LOVE AND MISS YOU ALL! Wow, just wow. This is just amazing. I needed a good “humans are awesome” story today-thank you! Yes! Bahamians are awesome!! This island of Eleuthera has the best people we’ve found. So welcoming. We’ve never seen anything like it except here and in Bimini. Heading to the marina and land of free wifi tomorrow !!!! So maybe Wednesday for FaceTime? I was wondering about the u-turn on Spot. Tell me the problem was fuel, maybe a filter? Can’t wait for the next issue to come out , love your photos an writing, think you have a new career. Chip – exactly what it was. Changed the filter and got a new prime and we were good to go. You certainly know this cruising lifestyle! Good call! Amazing the people that you meet!! 🙂 Sail on! Sounds like I’m reading the book Spark Your Dreams where one malfunction or engine repair leads you on a new adventure! And even while dealing with meltdowns…. Always knew you guys were patient, but this trip has probably given the word a whole new meaning. Loved reading this post and being reminded to go where the wind takes you. Miss you all. What an education. You guys are amazing.